Two sixth-plate daguerreotypes, cased together. Left: nurse and child (“Bradford & Ellen Sherwood his nurse”), right: parents (“Jonathan P. Harrison & his wife Caroline Denny Harrison”). White family’s cheeks are hand-tinted and the baby’s dress is hand-colored. Some spots, edges tarnished. A tremendous pair. Jonathan P. Harrison (born 23 December 1829) and his wife Caroline Denny Harrison (born c. 1834) are in one portrait, while their son Bradford (born c. 1853) and his black nurse Ellen Sherwood are in the other. The Harrison family moved from Talbot County on Maryland’s Eastern Shore to Texas in the 1850s to pursue ranching and farming opportunities. According to the U.S. Census, in 1860 the family lived in Corpus Christi, Texas, with Jonathan reported as 29 years old, Caroline 26, and Bradford 7, indicating a date of 1853 for this photograph. The Harrisons and Dennys were prominent Maryland and Texas families. Jonathan served with the 1st Texas Cavalry during the Civil War. 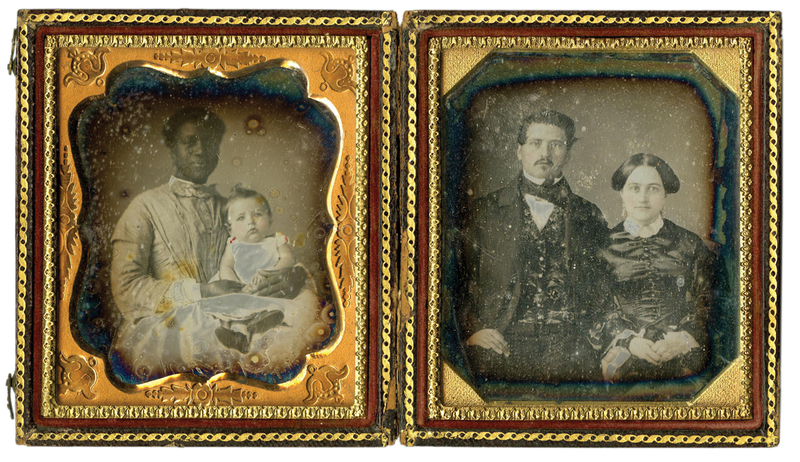 Identified daguerreotype portraits of slaves are rare, and linked pairs such as this set are very rare. It is conceivable that Ellen Sherwood was a free black, but given the status of the Harrison and Denny families, it seems probable that she was a slave. This splendid pair of photographs vividly demonstrates the complexity of black-white relationships in the antebellum South. Provenance: “Jonathan P. Harrison & his wife Caroline Denny Harrison / Their child Bradford & Ellen Sherwood his nurse,” identified in a manuscript note, beneath the right daguerreotype, in the hand of Jonathan’s niece Patty Belle Tilghman (1851-1931). See Hanson, Old Kent: The Eastern Shore of Maryland, p. 96.